Hong Kong moves to make disrespecting Chinese national anthem a crime - SABC News - Breaking news, special reports, world, business, sport coverage of all South African current events. Africa's news leader. 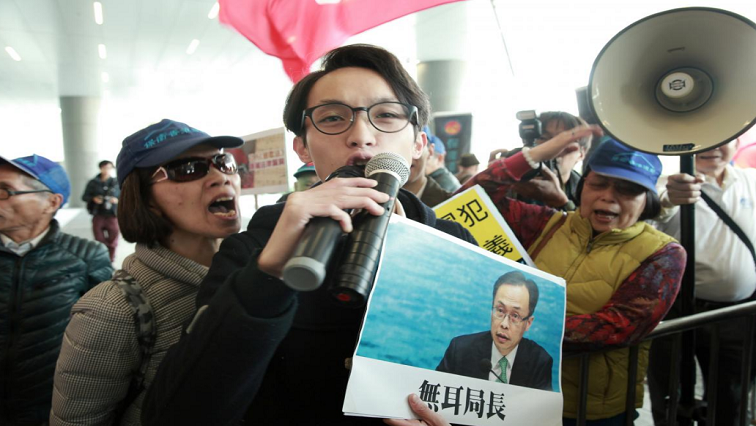 Pro-democracy activist Figo Chan, holding a sign showing Secretary for Constitutional and Mainland Affairs Patrick Nip, clashes with pro-Beijing protesters over the Chinese national anthem law controversy outside the Legislative Council Complex in Hong Kong, China, January 23, 2019. Hong Kong on Wednesday presented a controversial bill to lawmakers that prescribes jail terms of up to three years for disrespecting the Chinese national anthem, a move critics say raises fresh fears over freedom of expression in the city. Chinese authorities have strived to instil greater patriotism in the former British colony at a time of heightened tension between democracy activists and forces loyal to Beijing, with some in Hong Kong even advocating independence from China. Besides imprisonment, the measure would fix a maximum fine of HK$50,000 ($6,370) for those who publicly and intentionally disrespect the anthem, the “March of the Volunteers”. “I think teachers would feel worried about this proposal, because if we allow this government to pass a law to instruct the teachers what to teach, well, this time it is for the national anthem, maybe next time it could be other things,” said secondary school teacher Simon Hung, 36. Small groups of pro-democracy and pro-Beijing protesters taunted each other outside the Legislative Council, shouting and chanting through loud hailers. Booing the anthem at soccer matches in Hong Kong has emerged as a form of political protest in the past few years, seized upon by young people keen to demonstrate their frustration at Beijing’s perceived creeping influence. The global financial hub returned to Chinese rule in 1997 under a “one country, two systems” formula that promises the city a high degree of autonomy, including freedom of expression. The anthem proposal is expected to pass easily when it comes to a vote – probably before the summer – as the opposition does not have enough seats to block routine legislation. Calls for outright independence are a red line for China’s Communist Party leaders, who deem Hong Kong an inalienable part of the nation. But many young people in Hong Kong have become increasingly angered by what they see as China’s encroachment on the city’s culture and autonomy, with some advocating “localism”, or a Hong Kong identity, rather than a Chinese one. In 2017, mainland China adopted a law banning disrespect for the anthem. A similar measure is being reviewed in Macau, a former Portuguese-run enclave that returned to Chinese rule in 1999. This entry was posted on 23 Jan 2019,10:13AM at 10:13 AM and is filed under World. You can follow any responses to this entry through the RSS 2.0 feed. Both comments and pings are currently closed.